during the NASCAR Xfinity Series Kansas Lottery 300 at Kansas Speedway on October 20, 2018 in Kansas City, Kansas. John Hunter Nemechek played 2018 NASCAR Xfinity Series playoff spoiler on Saturday and claimed his first-career series win in his 15th start when he took the checkered flag in the Kansas Lottery 300 at Kansas Speedway. Daniel Hemric was the highest-finishing playoff driver, taking runner-up honors after leading a race-high 128 of the 200 laps that made up the race. He and Nemechek combined to lead all but eight laps of the race, with Nemechek’s 64 laps-led tally. No other driver led more than two laps. Nemechek is the third winner from behind the No. 42 Chip Ganassi Racing Chevrolet in 2018, joining Kyle Larson and Ross Chastain. Hemric and Nemechek were the two stage winners. 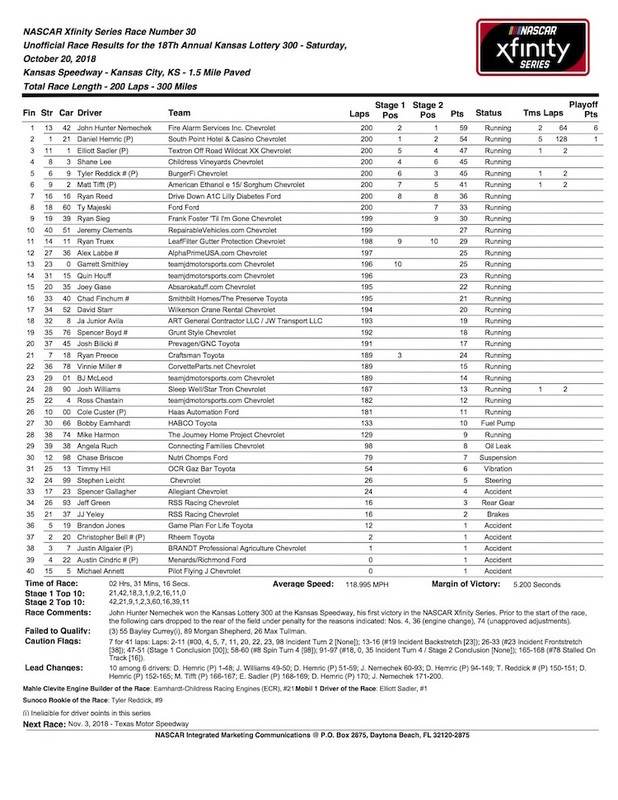 Hemric won the first 45-lap stage after starting on the pole and leading the entire opening stage. Nemechek took the lead on a lap-60 restart and was up front when the second stage ended at lap 90. Hemric retook the lead on pit road after the second stage, and Elliott Sadler led a couple of laps through a pit strategy of taking two tires during the final caution of the race on lap 164. Hemric and Nemechek, though, got up to first and second soon after the restart and traded the lead back and forth before Nemechek took his final lead on lap 171. Four playoff drivers finished in the top-six in the first race of the round of eight, with Sadler in third, Tyler Reddick in fifth and Matt Tifft in sixth. The other four, though, were outside the top-20, three of them in the final five spots of the finishing order. Justin Allgaier, Austin Cindric, Christopher Bell and Cole Custer were involved in a nine-car wreck, for which Allgaier took responsibility, on the first lap. Allgaier, Cindric and Bell retired from the race right after the wreck and finished 37th through 39th. Custer continued but wound up 26th after spending time in the garage to repair a power-steering issue.